Glass shower enclosures from Clayton's Glass will add elegance and beauty to any bathroom. Clayton's Glass offers framed, frameless, and semi-frameless shower enclosures with a wide variety of glass texture, color, and thickness options. Plus, our extensive shower hardware selection guarantees your new glass shower will be one of a kind and uniquely yours. Clayton's Glass offers a nearly limitless variety of shower configurations, options, and accessories, but we are perhaps known best for our Euro Frameless Shower series. The flexibility of the Euro frameless shower's configuration allows your shower designer at Clayton's Glass to create a highly personalized shower including steep angles and curves that would not be possible with standard or framed shower configurations. If you're looking for a glass shower door or a glass enclosure for your tub, Clayton's Glass has everything you're looking for. We have many different glass and hardware options to choose from, so you can create a truly unique statement. Take a look at our glass shower image gallery for glass shower door ideas. There are so many options when it comes to glass showers. Where do you start? When it comes time to start planning for your new glass shower, call Clayton's Glass at (806) 373-2000 to speak with a professional shower design consultant. 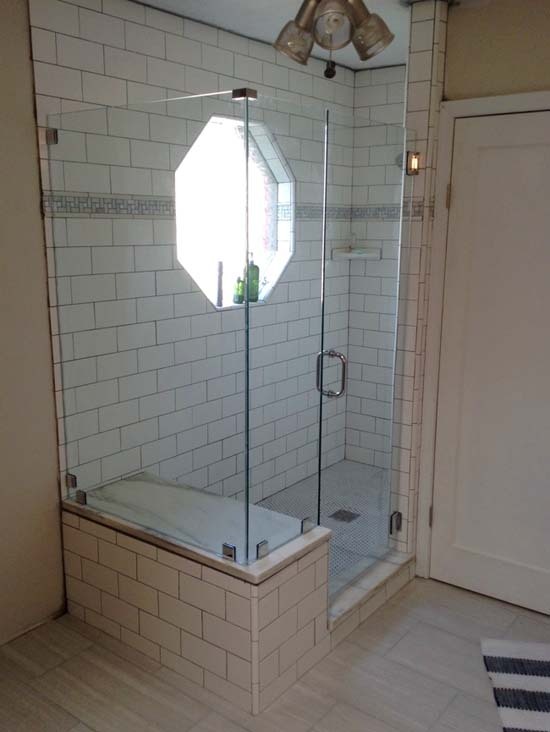 The shower design consultants at Clayton's Glass are well versed in each and every configuration possibility, along with the glass used in your shower's construction and any limitations a particular shape may have within your space. During your shower design process, we will help you establish the size and shape of the shower as well as make suggestions for texture, hardware, and other accessories to give your new glass shower a sense of presence and elegance. Clayton's Glass is now an authorized reseller of Cardinal Cast Glass Enclosures! Browse the Cardinal Shower Enclosure Gallery. Keep your shower enclosure spotless and clean with EnduroShield glass treatment. EnduroShield's easy clean protective coating creates an ultra-long lasting shield on all glass surfaces, reducing cleaning time by up to 90%. EnduroShield helps protect against staining and build-up. Aesthetics - How is your new shower going to fit into your existing bathroom or your planned new bathroom? Maintenance - How easy is the shower to clean and how often should it be done? Cost - Will this break the budget for your bathroom renovation? Your new shower should complement the rest of your bathroom, working with the other elements in the room to complete a harmonious look. For instance, a chrome finish framed shower complements chrome bathroom fixtures quite well while a frameless shower would tend to blend into the background. On the other hand, a frameless shower will highlight tile or stone work in the bathroom while a framed shower tends to overwhelm these accents. Frameless showers are much easier to clean than their framed counterparts. With nothing to work around other than the shower hardware, the doors and enclosure walls can easily be wiped down. Framed showers, however, require more frequent cleaning to ensure there is no water sitting in the frame which can cause deterioration over time. When it comes to price, frameless showers tend to be a bit more expensive due to the way in which they are constructed. With no other support other than the glass, the bond between panels is crucial. Also, the panes of glass in a frameless shower tend to be slightly thicker to support the weight of the enclosure. The vast configuration options of the frameless shower will increase the cost of the enclosure as well. Additional work must be done to fabricate steep angles and curves that are not possible with framed showers.